The Jacob sheep takes its name from the story told in the Old Testament Book of Genesis of how Jacob became a selective breeder of pied sheep. The Bible story tells how Jacob, the second son of Isaac and Rebecca, had so infuriated his older brother Esau that he was sent away to stay with his uncle Laban who lived over 1000 kilometres from Jacob’s home. While he was there, Jacob fell in love with his beautiful cousin Rachel, but had to work as an unpaid shepherd for his uncle Laban for fourteen years before permission was given for them to marry. After Jacob and Rachel’s son Joseph was born, Jacob wished to return to his own country. To retain Jacob’s services as a shepherd, Laban promised to allow Jacob to establish his own flock by taking all the spotted and speckled sheep and black lambs from Laban’s flock. Laban agreed to this, but then gave his sons all the black lambs promised to Jacob. “I will go aboute all thy shepe this daye, and separate fro all the shepe that are spotted and of dyverse colours, and all blacke shepe among the lambes and the partie and spotted among the kyddes: And then such will be my reward.” ‘The fryst book of Moses, called Genesis’, William Tyndale, 1530. Jacob took all the spotted and pied sheep that were left, used them to establish a large flock and grew exceedingly wealthy. God then came to Jacob in a dream and told him that he should return to the land of his birth, so Jacob fled with his wives and children and flocks and returned to Canaan and also home to his father Isaac. During the flight, Jacob’s son Joseph was sold by his brothers to a caravan of traders carrying gum, balm and myrrh. Joseph eventually settled in Egypt where he became governor. At a time of famine the brothers, not knowing that Joseph was governor, came to Egypt to buy corn. Joseph recognised them and ordered that they be imprisoned. He later released them and told them to return to his father Jacob and ask him to come to Egypt with his children, his children’s children, his flocks of pied sheep, and all that he had. Jacob’s pied sheep thus travelled from Palestine to Egypt. Over the following thousands of years, so it is said, the descendants of Jacob’s sheep travelled to Spain via the coast of North Africa and Morocco. In the 17th and 18th Century, Jacob Sheep were imported from Spain by the British landed gentry. 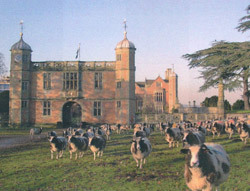 The oldest known flock which were imported in the 1750s still graze at Charlecote Park in Warwickshire (below). The Jacob breed with its splendid horns and distinct spotted fleeces made it an ideal ornamental sheep to graze with deer in parklands surrounding castles and stately homes. By the end of the First World War, many of these flocks had disappeared and by the mid part of the century there were very few Jacob sheep. A small number of dedicated breeders and enthusiasts were determined to preserve the breed, and in 1969 the Jacob Sheep Society was formed with 96 members and 2,700 registered sheep. The first president of the Society was the Dowager Duchess of Devonshire of Chatsworth Estate in Derbyshire. In its early days, the breed was registered as a Minority Breed. Today, the Society has more than 850 members and around 2000 sheep are registered each year in the flock book. In 1974 the Rare Breeds Survival Trust was formed and reported that the breed was ‘the success story of recent years’ with over 5000 registered sheep in the flock book; ‘the progress of the Jacob in the last two or three years provides a blueprint for the conservation and development of other rare breeds’ it added.